Warrington Township municipal offices are located at 852 Easton Road, Warrington PA 18976; phone: 215-343-9350. Warrington [†] was established in 1734 and named for a borough in the north of England between Liverpool and Manchester. The township remained wilderness for many years because of its location and because much of the land was held by absentee landlords. The township's boundaries are those planned by William Penn's surveyors. Master survey lines were drawn extending northwesterly from original settlements along the Delaware River and serve as boundaries for original land grants as well as courses for future highways. These lines serve as boundaries between Philadelphia (now Montgomery County) and Bucks County and became the basis for a grid system in Bucks. The parallel lines were called Street roads (County Line, Bristol, and Street roads). All roads running northeast to southwest were to intersect at right angles. The grid established by Penn forms much of what is now Warrington Township. Villages such as Warrington, Neshaminy, Pleasantville (Eureka), and Tradesville were established at crossroads and served as marketplaces and gathering places for the farming community. Goods produced in the township were shipped by wagon to larger markets in Philadelphia. The villages were stopping points for travelers moving between Allentown, Easton, and Philadelphia. The Warrington Inn, in the village of Warrington at Bristol and Easton roads, was built in 1782 and served wagons and stagecoaches on Easton Road. The village of Neshaminy, at the intersection of Street and Easton roads, was named after the nearby creek. The Frog Hollow (Old Time) Hotel just south of the village was built to serve travelers fording the Neshaminy Creek. Post offices were established in Warrington and Neshaminy villages in the 1800s. School board minutes from 1841 indicate that there were five schools. A trolley line constructed along Easton Road in the early 1900s afforded access to Warrington. This line made it easier to travel to Doylestown and to a number of vacation home communities built along the banks of the Little Neshaminy Creek where city dwellers seeking relief from the heat and illnesses of Philadelphia settled. The Route 611 Quarry opened in the 1920s and added industrial activity to the township's northern corner. As the Philadelphia metropolitan area grew in the 1970s, '80s, and '90s, people moved into the township, and its population more than doubled. Many of these new residents moved into new subdivisions created on farmland. Along with the new residents came commercial and industrial development, primarily along the main roads. Steady growth continued throughout the 2000s, seeing some of the last large tracts along Easton Road be developed into both commercial and residential uses. In addition, the number of open space and park acres grew as well as additional linear feet of trails and walkways. The Warrington Township Historic Commission's book, Warrington Township - The Gateway to Historic Bucks County, provides a summary of the important historic resources of the township. Relying on their own research and that of the Heritage Conservancy, the commission catalogued over 50 historic buildings which have been studied as historic sites. Their report provided the foundation for the township's historic resources preservation ordinances. The Heritage Conservancy surveyed over 140 sites with structures built before 1940 in a 1988 survey. The properties are located throughout the township, with some concentrated in the villages of Warrington, Neshaminy, Tradesville, and Eureka/Pleasantville. Several of the individual historic resources in Warrington inventoried by the Heritage Conservancy may be eligible for inclusion on the National Register of Historic Places due to their significance in the history of the nation. 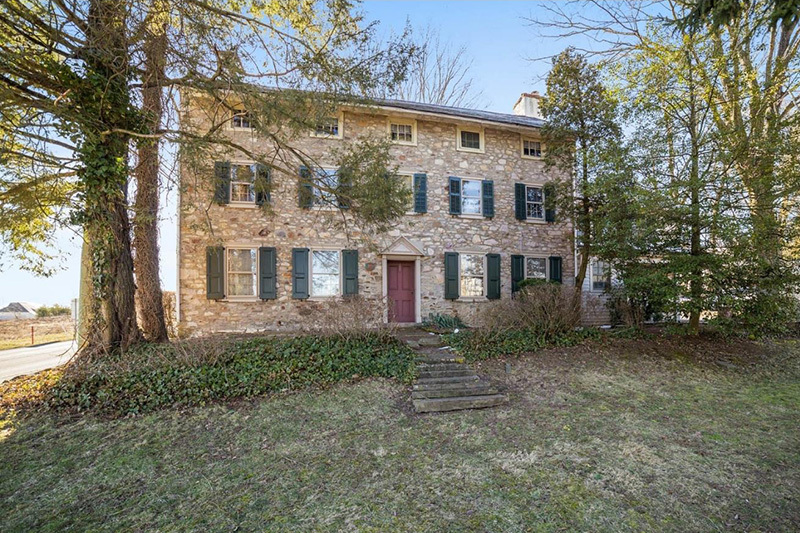 At least eight properties are deemed eligible for the National Register of Historic Places by the Pennsylvania Historical and Museum Commission. The village of Warrington once contained clusters of buildings on all sides of the intersection of Easton and Bristol roads. Today, the Barclay house (ca. 1799) and Warrington Hotel (ca. 1800) remain at the intersection and have been redeveloped and operating as a restaurant and office building, respectively. Many of the buildings in Warrington were removed to allow for construction of Easton and Bristol roads. However, several original village structures still remain, such as the former Amelia's Flowers building (now vacant), the Irwin house (recently adaptively reused as an office), and the one-room schoolhouse along Bristol Road (currently operating as a gift shop). The village of Neshaminy at the corner of Easton and Street roads has disappeared over time. A collection of wooden structures just south of the intersection on the east side of Easton Road appears to be historical structures, one of which was a church. The village of Tradesville at the corner of Lower State and Bristol roads contains two stone homes with accessory structures. The other half of the village in Doylestown Township contains a modern gas station and stone dwelling. The village once had a general store. The village of Eureka/Pleasantville at the intersection of Lower State Road, Limekiln Pike, and County Line Road was in Warrington and Montgomery townships and contains several stone dwellings along Limekiln Pike. The Pleasantville Church (ca. 1898) on Limekiln Pike is an original village structure. † Warrington Township Board of Supervisors and Planning Commission, Comprehensive Plan Update, 2018, www.warringtontwp.org, accessed October, 2018.